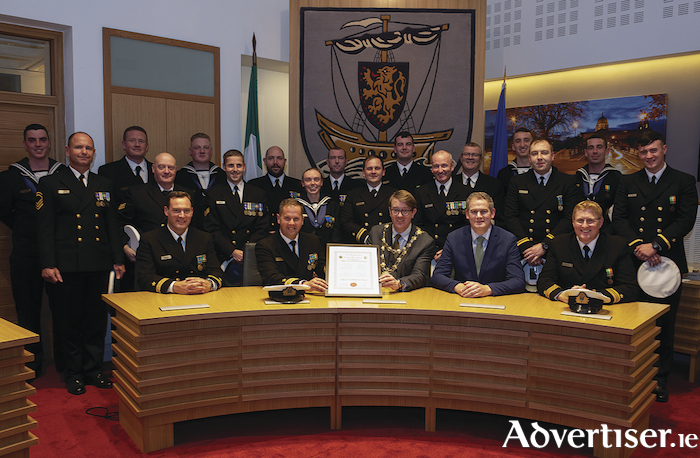 Galway City Council last weekend hosted a Reception to honour the Twinning of the City of Galway with the Irish Naval vessel the L.É. William Butler Yeats. Minister Sean Kyne, Minister of State for Natural Resources and Digital Development represented the Minister with responsibility for Defence, Paul Kehoe T.D. at the event. In a ceremony officiated by the then Taoiseach Enda Kenny on October 17 2016, the L.É. William Butler Yeats was officially named and commissioned at Galway Docks. The ship was officially named by the poet’s granddaughter Caitriona Yeats. There is a long and distinguished relationship between the City of Galway, Galway City Council and the Naval Service which has lasted over the years. 28 September 28 1996, Galway Corporation (now Galway City Council ) on behalf of the people of Galway City formally adopted and twinned with the Irish Naval Ship, the L.É. Aisling and resolved to develop a special relationship with the ship and crew to promote awareness of the role and functions of the Naval Service.